Okay, But What About All Those Tropes vs. Orcs in Video Games? But what about Orcs? Some jokers (or maybe actual Orcs!) 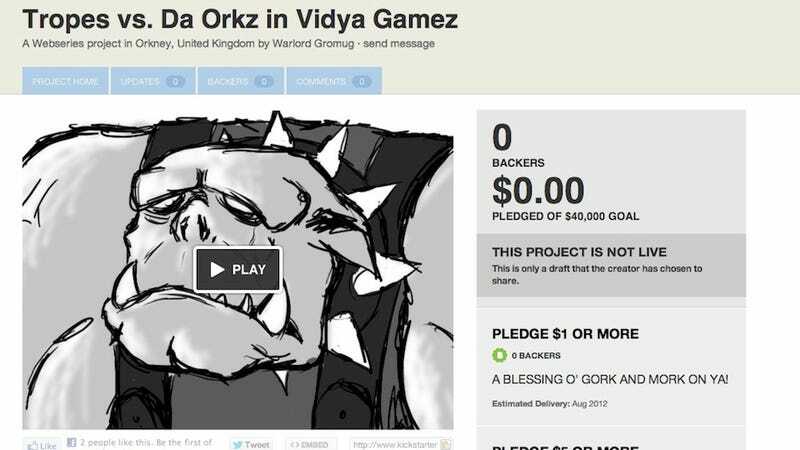 have put together this draft kickstarter page to raise money for a film about all the problematic ways Orcs are depicted in games. Of course, this is a draft—it seems... unlikely that something like this would actually get approved by Kickstarter. Okay, I know that the guys making this are likely the same generally assy dudes who have been "protesting" Anita Sarkeesian's video, but this also made me laugh? Warlord Gromug is an ork warboss and socio-economic spectator who has an over-inflated sense of self-entitlement. He uses his meagre following to launch ill-fated attacks against Imperium space, as well as providing an important and fresh insight into modern pop culture. His videos are used as educational tools in classrooms and are screened at conferences and film festivals . He claims to speak internationally and lots of other things that appear to have no basis in truth. Sigh. Guys, you had me laughing despite myself, but you just had to overstep, didn't you? Of course you did. Oh, well. The first part was funny.